The living room is a place where we gather as a family and entertain friends & guests. Think about all the great time you spend in your living room. So it makes sense if you’re considering some amazing interior design ideas for your living room. Using cool & calm color palettes is a great way to add life to any room. I recommend using vibrant colors against neutral tones. The contrast will add life and dimensions to your living room. If your living room isn’t that big, don’t let it keep you from jazzing up the space. A great way to make the place look bigger is putting a big mirror on the wall. This will create an illusion of a wider space, while also adding depth to the area. Just an interesting anecdote about using mirrors like this; during the filming of the movie Titanic, director James Cameron had the crew add huge mirrors in the “engine room” of the “ship”. The set was not that big so this technique made it look like there were much more people working around the engines of the grandest ship in the world. Why not your use a similar technique for your home? Remember, while you want to enliven your living room, you need to avoid creating an overly-shiny area. So try adding different textures such as velvet or any colorful fabric and draping it over certain pieces of furniture. Throwing a bold, red rug in the middle of almost any living room will add warmth to the area. Of course you will have to make sure it is going with the rest of the place. If you’re applying certain texture to your floor, adding a colorful rug will certainly create a cozy effect to an otherwise stiff room. If you happen to have a large living room, you can use runner rugs to separate the open space and break it down into smaller, more intimate sections. Nothing adds a bright look and feel to a room than fresh flowers. Go ahead and buy some large vases (slim ones if that’s your style) and put in fresh blooms. It will bring touch of nature to your living room. Moreover, don’t underestimate the magic of green foliage. Adding houseplants or even grass growing in small pots will create a stunning visual effect in your living room. If chosen correctly, wallpapers are s a great way to make your living room more interesting, in a good way. Whether for highlighting a specific wall or framing an attractive piece of furniture, you can use wallpapers for many purposes. There’s so much design variety that you can create that perfect look you have in mind. For instance, even you’re choosing a floral design; you don’t have to be traditional if you don’t want that. You can also adorn your wall with funky wall stickers. These are especially a great idea if you’re living in a rented house as you can easily take these off when you shift. You can choose contemporary designs and create a living room look that’s modern despite the touch of nature. 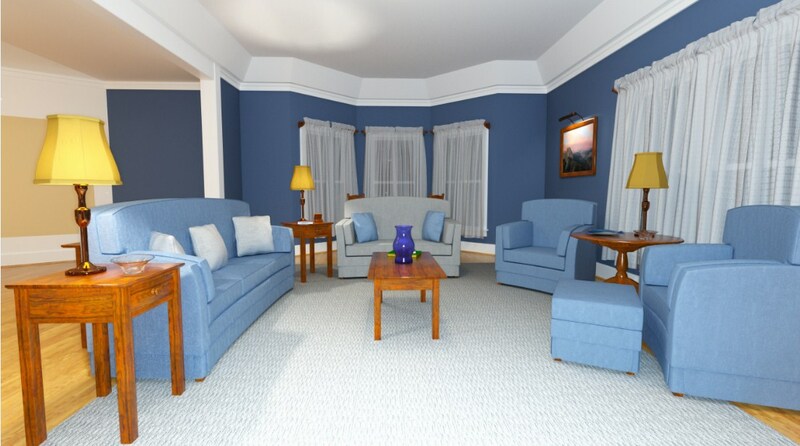 Changing the look of your living room can be fun and easy. You just need some great interior design ideas for your living room. Now that you have some really great ones, go ahead and transform your living area!